If you don’t already have a records management policy in place at your place of business, it would be a very good idea to get one set up. Making sure that your company has a records management policy is extremely important in maintaining success. Your records should be one of the most important parts of your business. If something were ever to happen to your secure documents, what would your company do? It has been said that 90% of businesses that lose their companies records end up losing their business within the year because it is so hard to get everything caught back up. Depending on the type of business you operate, you are looking at client’s files, your own company’s information, and also your staff information. How Do you Implement a Records Management Policy? Implementing a records management policy isn’t very expensive nor does it typically take a whole lot of time on your part depending on how you go about it. First and foremost you want to find out what requirements your company has, and if they don’t have any as of yet, you want to figure out what you would like to accomplish for your records management. You will then want to figure out exactly how many records you have and what they look like. Once you have this information you can browse around at different ways to store your records and decide which program is going to be the most beneficial for your business. Whether you need additional security features, or you want to be able to access all files with a quick search, is all up to you and you will want to know exactly what you are looking for in order to make the right decision. Once you find a way to store your documents, you can either hire an outside company to put everything onto the system, or you can handle everything on your own. Want a Top of the Line Document Management System? Get Free Quotes Today! 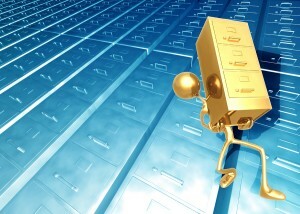 Creating a strategy for managing your documents and records is a key to success in business. It allows your company to run smoothly and efficiently and keeps everyone on the same page. Record Nations can set you up with the best document management system (DMS) for your office. Call us today at (866) 385-3706 or fill out the form on the right for free quotes.